BMI measures weight in relation to height, and the Body Mass Index Chart provides you with some samples of that relationship. 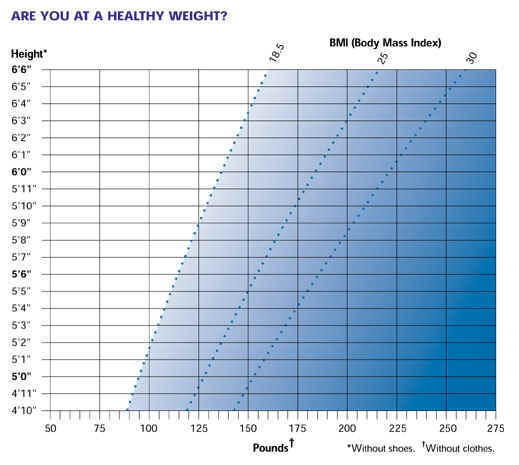 The BMI ranges shown above are for adults. They are not exact ranges of healthy and unhealthy weights. However, they show that health risk increases at higher levels of overweight and obesity. Even within the healthy BMI range, weight gains can carry health risks for adults. Directions: Find your weight on the bottom of the graph. Go straight up from that point until you come to the line that matches your height. Then look to find your weight group. Healthy Weight — BMI from 18.5 up to 25 refers to a healthy weight. Overweight — BMI from 25 up to 30 refers to overweight. Obese — BMI 30 or higher refers to obesity. Obese persons are also overweight. Source: Report of the Dietary Guidelines Advisory Committee on the Dietary Guidelines for Americans, 2000, page 3.